I heard your piece on NPR today and really enjoyed it. I'll be reading your blog to see how this experiment goes. Do you think maybe you could talk more about your worm composting system? Many people still don't know much about vermiculture and it's a system that would work great for people who don't have room for a regular composting system. How big is your worm compost bin? I used to have one for about half a year, maybe 1' x 2.5' rectangle, single layer (I didn't quite make it to the second layer). Maybe I didn't take care of it well enough, but it seemed like it would take forever for the worms to work their way through the stuff I put in (eggshells, food scraps, junk mail, eggshells, and more eggshells). For the sake of space, why don't you simply document the things that you can recycle and then recycle them. Yes, it costs energy, but I seriously doubt that you're going to be able to fit all of your garbage into your basement AND all of the things that you CAN recycle. In fact, I'd wager that you can't get 2 months worth of all your waste into your basement. Just a guess, but I've got a hunch I'm right. Okay, super dave, I'll chime in from two doors down. I agree with "anonymous" in that you should document items that can be recycled, then put them out in the blue bin. I think it's totally in line with your experiment and also "morally" kosher. That's what the blue can if for. Sure, it's waste, but recycling is a good thing I don't think there's any harm in participating. So there, free yourself -- document and recyle. This is a great idea, and i can't wait to see what you produce. Do you think you are "normal" in terms of how much waste you produce, or is this going to be teeny compared to the average joe? I made the decision that my New Year's resolution would be to REDUCE, reuse and recycle more than I have been. Then I heard about what you're doing on NPR and have not been able to get it off my mind. I am humbled by your activism. Bravo! I am inspired! I can't wait to check in on you as the year goes by. Thanks Katez and good luck on your quest. I may be a bit over the top at the moment, but everybody doing what youa re doing would do a heck of a lot more good than me doing what I am doing. Please pass the site along to as many people as possible and check in often. Is it okay for you to re-use something that is in your basement? If so, I DON'T think you should document and recycle the recyclable stuff. You should keep it around in case you find a new use for it. It looks like you have a lot of potential storage containers in there. You may also find that a good way to reduce trash is to make food or things from scratch using bulk materials, which will then need containers to be stored in. Thnkas for checking in. I do try to repurpose most of the stuff I have but unless I have a specific use, I put it on the list. If I end up using something it'll come off (the reason why the paper isn't in recycling but worm composting as it will eventually end up there). As for food from scratch, I couldn't agree more. My main problem is time, whihc is I think an underlying problem with a lot of this STUFF. That said, little by little I'm working my way there. Any recipes? which is a good thing for the economy. Bravo! I find it excruciatingly short-sighted of people like you and others in general who believe in trying to limit or recycle the waste they produce. Can you not pause to consider the impact your actions will have on the archaeologists of future civilizations? One man's trash is another man's treasure after all. We should all do our part to toss as much waste as possible, the livelihood of a future generation depends on it! I think this is a worthy experiment, more power to you for trying it!!! I'm currently teaching an afterschool mural program with NYC teenagers- our project is to paint a pro-recycling mural on carting containers for a company that does recycling and hauling for construction sites. The owner of the carting co. has told me over the about the difficulty in getting properly sorted recyclable materials- so many are tossed out. She's also told us how the NYC area has run out of landfills- so we're paying poorer states to take our garbage (in their poor neighborhoods). Imaging how much garbage NYC produces in a day!!! Also, our captialist pig Mayor Bloomberg stopped all glass and plastic recycling for YEARS. I also agree with Dave that recycling in itself is not a final solution- the process is energy consuming and toxic- and usually done in low-income areas negatively affecting local's health. E-waste recycling is it's own nightmare, there's no real safe way to do it. So kudos, I'll tell my students about your project!!! Heard you on KROQ had to check it out . Im very impressed and it makes me want to do my part. Right on man and thanks for checking things out. So what's your part going to be? Good luck, and thanks for bringing this novel idea to the rest of us. Hah, yeah, I didn't realize but more than a few people have pointed that out. Thanks for checking in! Hey Dave! I think your idea is brilliant! I know you probably get this a lot but i am really impressed that someone has brought the thought of conserving into mind and will go through with it! I believe that one you've accomplished your goal,you will have made a difference! I heard your interview on WRIF this morning and decided to check you out. Thanks for enlightening us. Hi, I heard your interview in Chicago on WGN radio this afternoon. I have to say it sounds like a great idea and will hopefully persuade more people to watch what they buy in the first place and especially what they get for "free" (product samples, brochures, junk mail, promo items, etc). Keep up the great work! I just listened to you on XM156. What an amazing impact you are having on our enviroment as well and listeners. I am now much more aware of my familie's consumption, and hopefully will make small changes soon for our world. Thank you for everything! Wow! I was so inpsired by what you are doing after hearing you tonight on the radio. I listened with my 12 year old daughter and we had a great discussion about how we can begin to change our lives...starting with water bottles! Thanks for sharing this experience....I work with kids and I think they should all hear this message. I can't tell you how happy emails like yours make me feel. Make sure to keep talking to that daughter of yours and more importantly, listen to her. I teach a seminar on sustainability to school kids and she is at that great age where she is questioning things. SHow here the injustices that are out there and she will want nothing more than to challenge them. Funny, because I was just thinking to myself a few weeks ago what would happen if the trash trucks stopped coming around to take away everyones garbage; We would be faced to deal with what we consume and throw out. Then I heard your interview on the XM radio earlier today and was so fascinated with what you are doing. Although I consider myself to be very conscious about what I buy and use, I think that the some of the things you pointed out today will help me to take my efforts further. thanks for your courage in taking on this amazing project! I just stumbled on this project through a news article somewhere online. I find it a very interesting experiment and also commendable. I certainly hope this exercise raises some much needed awareness as to the amount of waste human beings produce and but also provides some solutions on dealing with our excessive consumption and waste production. My only concern is the rule regarding your children and their waste. Anything and everything you do essentially leaves it's foot print on the bio-sphere. Wouldn't producing children (who themselves become consumers and produce waste) mean that you are responsible for the effects their existence has on the bio-sphere? Thanks so much for your comment and for being spot on with your observation. Yes, my children will have a footprint, essentially my responsibility since I have brought them here (well my wife, but you know what I meant). That said, they are 4 and 6 and in school so I can't really be responsible for their waste stream all, or even most of the time. I decided to not include them not for reasons of overall impact, but for reasons of having an accurate study since I can truly say I'm accounting for everything that is mine, and then some. You'll notice that when they are with me, I take their waste, since in essence I am making their purchasing decisions. Would have loved to have them involved, but I just didn't know how honest it would have been in the long run. Just came across your blog via an article on the Internet and bravo for joining the effort. I've been doing what you have (well, I recycle everything immediately) with a result of having maybe a few gallons of trash a month. Time does seem to be the most constraining factor. Anyway since you're much better connected, here's an idea you can run with. 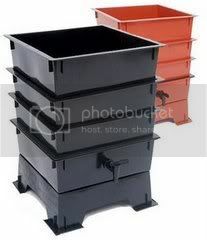 Instead of vermicompsting, switch to a tumbling composter instead, then shred all your paper and use it as a carbon source to balance with the nitrogen rich food. Then build a crusher and ball-mill to reduce all glass to sand and add. You'll probably quadruple your sustainable waste! Next, build an unlicensed incinerator and shred and burn all our plastics at around 1800 F, but capture the cleaned emissions and capture the CO2. Now here is the piece that ties it together: Create a greenhouse, and use the homemade soil and captured CO2 to grow something quick-growing at a high concentration of C02. Your entire output, baring metals will be sustainable, and metals can easily be recycled. That's the vision I'm moving towards away. Good luck with your exploits. All I can say is....WOW. You're either poking fun at me or much smarter than I am (or both) and I applaud you for your efforts. Wild! Good for you man. People would benefit from this type of experiment -- it brings real perspective to just how much we waste. The National Wildlife Federation recently finished a send-a-letter-to-the-EPA widget and Facebook application that sends an official message to the Environmental Protection Agency urging them to recognize the impact greenhouse gases are having on our planet. We're trying to drum-up up some support for their cause. If you're so inclined, we'd appreciate a link to either application or simply spread the word! Thanks so much! It's good to see that someone has taken responsiblity for their own waste. My family and I recycle as much as we can, but still wind up with at least one bag of trash every week. I applaud your efforts and hope to see you succeed. Like many others, I saw you on CNN this morning. To date, I do little to recycle. If nothing else, you have made me more aware of what to buy and what to properly dispose of. Your site is now in my 'favorites' and will be read often. Thank you for your efforts. Thanks so much for the nice note. That's the whole point of all of this, to get people to start thinking different. Great site! Saw your special on CNN. I too am a green (hybrid driving thermos drinking trash recycling fiend ;) So happy to see someone else getting the word out there! Hello from Strasbourg in France ! I just discovered your very interesting website. "get people to start thinking different"
I wish you a blessed christmas for you and your family. Dave, Amazing job with one glaring exception. Your families consumption of meat, including fish, is one of the worst contributors to destroying the environment. Even worse than car emissions. Have you considered going vegan, or at least vegetarian? Thanks for the comment. I am actually a fish eating veggie and make pretty specific choices about the fish i eat. The project is mine not my families and while my wife is inclined to let go of meat, she's not there yet. All things in time and you can't force someone to do something they aren't ready to do. Dave- Do you know about freecycle.org? It's also dedicated to keeping stuff out of the landfill. I've written about them quite a bit. I am very excited to hear that you have done this project, even though it's nearly over. I was actually looking for some advice. I'm almost 17 and am looking for ways to get environmentally active. We recycle as much as we can at my house, and compost too (mostly because of my constant urging to do so), but I want a way to reach out to other people in my community, especially others my age. I have joined the sustainability group at my school, but this group seems to talk more than take action. I am not sure what I can do, especially because my family and friends aren't very enthusiastic about my "green-ness". Do you have any advice? I live in Central Vermont. I am Malaysian and my English is so poor.So,please dont laugh at me if my English got any mistake.Dave,you now are so famous even my country's newspaper-Sin Chew Daily News got an article for you.It is so good that got a lot of people very enthusiastic about our enviroment.But do you think what you have done are useful if the goverment still didnt have any action to protect our Earth? Your English is quite good and thanks for stopping by. I completely agree that government has to be part of the solution but that said, as citizens, we should still do everything we can and pressure government to act as well. It's like I tell people. Will me not drinking plastic water bottles fix the problem? No. But the problem can't be fixed until I stop. HI. I just found out about this today and I love how wonderfully you expressed everything in this first blog. I love the idea, I love that you completed it and I can't wait to see how it went. Thank you so much for the kind words. I hope you find the journey educational and amusing! Good idea on this. I know that unless I had storage that I couldn't do this so mad props on doing this and completing it. It's crazy to know how much we waste and that we should do something about this at a faster rate. I think it's a good idea.. i agree that recycling is better than throwing away. =)good point there. I just posted something up there. Idea is really good. Nice Article Posted. and i can't wait to see what you produce.